The player has the ability to dash at insane speed, allowing them to traverse difficult platforming challenges, and also cut down enemies in their way, giving this core mechanic a dual purpose. Loved it! Game feels great, it's awesome to retry each time seeing you're getting better at it. Huge role plays very good level design. First seconds are made in way that ensures player understands how to play and then placement of enemies which expects you to use a bit different strategy for each of them. Great game! What kind of country has knights and ninjas!? It'd make more sense to have samurais instead of nights. The dash mechanic was pretty cool. The reload time was kinda annoying though, as it would sometimes let me dash when still reloading and sometimes not. I'd remove the reload time and design the levels in a way to prevent the player from dashing through it all in one sitting. The music was kinda annoying though, as it lacks any kind of structure. I'd advise learning music theory and experiment using Garageband or FL Studio. Yeah, there were a lot of little annoyances that ended up in the final product here due to the time frame and also my lack of ability in some areas, but I'll definitely be working to improve them for future games. Hi, I played it all, and enjoy it, very playable, tight controls and simple but clever mechanic. Like someone says, the level design could be improved, but with the actuals level there's some great parts. My only problem while playing it's when the dash isn't active, sometimes I don't see the empty bar, falling in a pit when I expect to dash, maybe a little more signals or alert when you CAN/CAN'T dash. Just that. Congrats! 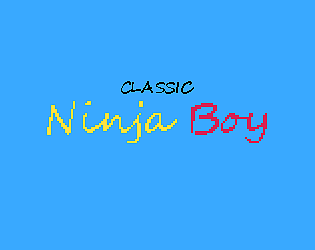 PS: I made a Ninja game too! :D check it if you can. Thx! Thanks very much for playing! I gave your game a try too - very cool stuff! I really like your game. The look of the game and the animations are good and instead of overloading the game with too much mechanics, you focused on just a few, which is great because this makes your game so solid. Beside the points Team404 mentioned, I have one other point to mention: Sometimes the character didn't jump, when I pressed the button. Maybe it happens when I pressed several buttons at the same time. I wasn't really able to figure it out. Because of this I died a few times and this was a little bit frustrating. Maybe you can take a look into this. Thanks for pointing it out to me - I'll look into that and try and upload a new build as soon as possible! That's all fixed now! Thanks again for pointing it out! First of all, the controls feel solid: they are responsive, feel fluid and are easy to learn. Character feels responsive and fitting for the concept as well. These things combined with some level design moments also create some interesting platforming challenges a la Super Meat Boy, for example with the saw enemies at the beginning of level 2. Lastly, the visual style is quite cute and endearing, with the visual feedback working well. However, there are some improvements we think could be made. - The main problem with the game and level design is the utilization of the dash right now. The dash lasts way longer than most of the jumps it is utilized in and is a bit hard to actually pin-point when it comes to where it is going to land you. It is much easier to play the game for 80% or so without dashing than it is with dashing. - Overall level design could also use some work. There is little to no use of negative space or quit moments to break up the actions (or at least, it never feels like there is), and teaching the mechanics to the player is not done well enough to actually make us realize what we have to do, with for example the level starting off with a wall the player has no idea they can dash through if they did not already follow the tweets you made during development about the game mechanics. Also, using elevated platforms for enemies to move between has little to no purpose within the level design if I can just dash through the platforms. - We were not sure what the purpose of the little box at the front side of the character is supposed to represent: none of the challenges in the game really show off clearly what it is used for. - The lone-standing flags dotted around the level do not actually serve as a checkpoint, which is quite confusing to players. - Coins during jump sections are not aligned well with the dash arc or jump arc, making getting coins quite impossible in some cases. - There is not a clear level end. Walking off-screen to end the level is not clear to the player (f.e. Mario has a flagpole, which 100% clearly signifies that the level has ended). - Enemy placement and/or patterns are not satisfyingly correlated with the dash. If I dash into one enemy to kill it in level 1 for example, 90% of the time you just die to the enemy moving behind it. Thank you so much for taking the time to play it! I really appreciate the feedback, and agree with a lot of it. I've never been so good at level design, especially when it comes to building around a single idea, and even felt myself that a lot of the sections were quite finicky or needlessly hard. I should have picked up during testing that the end of the level wasn't clear, and should also have figured out that it wasn't clear enough to the player that the box was an indicator of the length of the dash. However, I am very glad that you think that the core mechanic is strong - I felt this way too, but my level design and overall design in other areas didn't showcase it very well. This game definitely needs improvement, but thanks to you, I know that it can improve, deserves to improve, and how to improve it.